This Python IDE for beginners named Thonny is a simple editor with Python 3.7 built in. The official webpage can be found here and the GitHub project page is this. The development team is from the University of Tartu, Estonia with the help from the open-source community. Thonny grew up in University of Tartu (https://www.ut.ee), Institute of Computer Science (https://www.cs.ut.ee). I test it today with Fedora 29 and works well. Last metadata expiration check: 0:21:20 ago on Tue 09 Apr 2019 09:57:24 PM EEST. This editor can be found on Fedora repo, but I used the last released version software. Last metadata expiration check: 0:36:55 ago on Tue 09 Apr 2019 09:57:24 PM EEST. Today we tested with Fedora 29 a python module called DNF. All users have used this tool. This python module is not very documented on the internet. A more complex example can be found on DNF tool documentation. I tried to see what I can get from this module. Here are some tests that I managed to run in the python shell. You can see more about the Python programming language on my blog. Fedora 29 : Use Selinux with Firefox. Today I tested Selinux with the Firefox browser. The main purpose was to create a policy for this browser. You can use this example to create your own policies. Using Fedora 29 this problem can be resolved easily. Let's start with installing an important packet using the dnf tool. 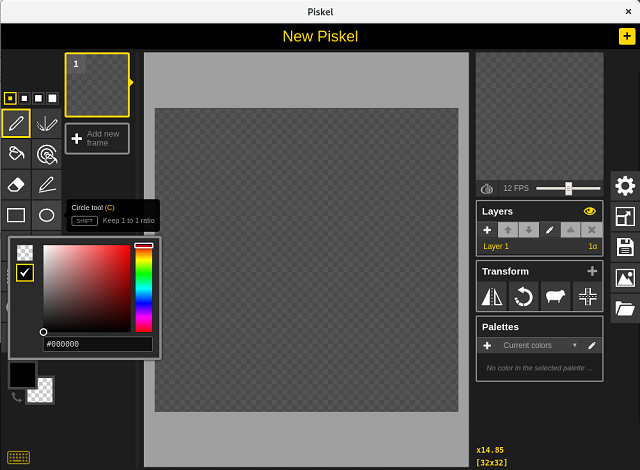 This application is a tool for drawing and create sprites. You can test online or use it locally by download it into your operating system. Create animations in your browser. Try an example, use Google sign in to access your gallery or simply create a new sprite. I download it to Fedora 29 distro and working well. Fedora 29 : Selinux and python. Today I tested the selinux python module with Fedora 29. The wikipedia page comes with this intro about SELinux: Security-Enhanced Linux (SELinux) is a Linux kernel security module that provides a mechanism for supporting access control security policies, including mandatory access controls (MAC). ... A Linux kernel integrating SELinux enforces mandatory access control policies that confine user programs and system services, as well as access to files and network resources. This kernel module can help you with security the network and running application on your Linux. This very complex kernel module can be used with your policy configuration files designed to fix your security issues. Last metadata expiration check: 1:31:46 ago on Thu 24 Jan 2019 07:04:16 AM EET. Fedora 29 : The AppImage tool and Krita Next. The AppImage is a universal software package format. The process of packaging the software in AppImage is a storage file provide by the the developer. This file is a compressed image with all the dependencies and libraries needed to run the desired software. The AppImage doesn’t really install the software just execute it without no extraction and no installation. Applications packaged in AppImage are not sandboxed by default. More about this can be read at official webpage. I tested the Krita Next with this tool. 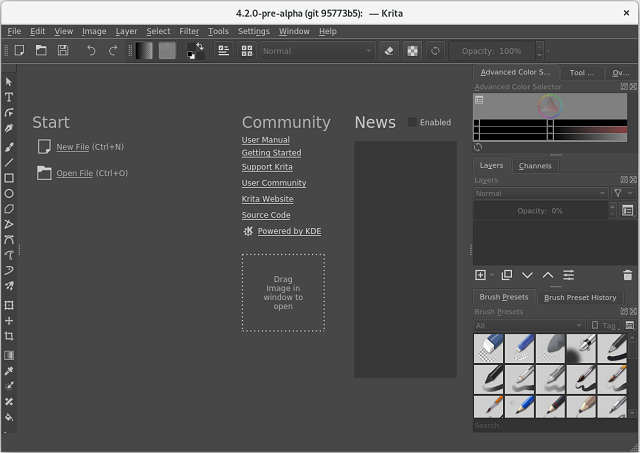 The appimage file of Krita Next can be found here. About the Krita Next this is a daily builds that contain new features, but could be unstable.